Life has not been easy on Isabail Grant. Growing up motherless and with an abusive father, the only family to whom she was close was her beloved brother. But her brother, a courier for the king, has been murdered by Aiden MacCurran and now Isabail is alone. The king has confiscated the MacCurran lands and Isabail is on her way to petition him to grant the property to her in recompense for her brother's death when she's taken captive...by MacCurran himself. Laird of his small clan, Aiden MacCurran is a man of loyalty, integrity and desperation. Falsely accused of killing the king's courier and stealing a valuable necklace, Aiden has been declared an outlaw and the members of his clan have been turned out of their homes and forced to live hidden in the woods. Aiden has mere days to clear his name and find the missing necklace before the MacCurran property is lost to them forever and his clan is scattered to the winds. His only hope is convincing Isabail Grant to tell him the names of the men at the castle the night her brother was killed as he's certain one of them must be the real killer. It would be too much to hope that the lass would come willingly. Isabail, as she has been taught by life, expects the worst type of treatment from Aiden and his men and is surprised when instead she's treated with care and respect. During her time at the MacCurran camp, the flicker of attraction between the two grows into a flame but desire does not equal trust...on either side...and a battle of wills ensues. Slowly, though, each begins to see that the other is more than they initially thought and Isabail starts to question her belief that Aiden truly is the man who murdered her brother. But when the opportunity to escape presents itself, will she trust the logic of her mind or the whispers of her heart? As with her debut book, Taming a Wild Scot, Keats thrusts the reader into the heart of medieval Scotland, complete with alpha heroes, strong-minded women, political intrigues and plenty of action. Her books flow smoothly, with both a story that reels the reader in and holds their attention and complex, intriguing characters who touch the heart. When a Laird Takes a Lady begins shortly after the end of the story in Taming a Wild Scot. While the primary romance in each of the books is brought to a conclusion in that book, the mystery of who stole the necklace is a story arc that continues across the series. Therefore, while When a Laird Takes a Lady can be read as a stand-alone, I believe readers will have a more complete understanding of both the events leading up to Isabail's kidnapping as well as the actions of Isabail, Aiden and other key secondary characters if they read the books in order. I'm an unabashed fan of medieval historical romance and am delighted to have another author joining the ranks of medieval authors such as Monica McCarty, Sue-Ellen Welfonder and Paula Quinn. I thoroughly enjoyed When a Laird Takes a Lady and am now counting down the months until Keats takes us back to medieval Scotland with the third book in this series, To Kiss a Kilted Warrior (Don't you just love that title?) in December, 2014. I'm looking forward to my next visit! Do you enjoy medieval historical romance? What do you like/not like about this era? Do you prefer books in this time period that are set in England or Scotland or do you just enjoy a good book, regardless of location? Have you read Rowan Keat's books yet? 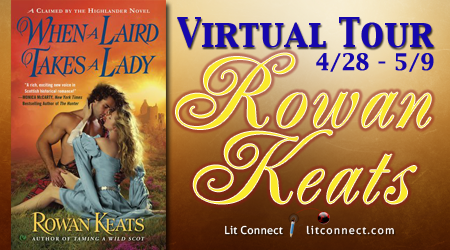 The Rowan Keats Virtual Tour for When a Laird Takes a Lady is giving away eight copies of the book to readers who enter the tour's Rafflecopter giveaway. (US/Canada only) Good luck to everyone! Rowan Keats pens historical adventures involving hot Highland heroes and the women they claim. Both TAMING A WILD SCOT and WHEN A LAIRD TAKES A LADY have earned 4 1/2 star reviews from RT Book Reviews, which labelled her "a rising star of medieval romance." When not writing, Rowan can frequently be found in a dark movie theater indulging in a large bag of popcorn, or watching the sunrise with a mug of steaming coffee wrapped in her hands. She lives in Central Canada with a goofy black lab, a very talkative cat, and a daughter whose own creative talents awe and inspire her every day. I do enjoy medieval stories but have never read any by Rowan Keats. I don't really have a preference for the location but it has been some time since I read one. I do like Medieval stories. I first read Elizabeth Lowell's Untamed trilogy set in England and then went on to read Margaret Moore's books set in England after the Norman invasion. I do like Scottish historicals too by Karen Hawkins and Karen Ranney. Merline Lovelace had a few books too. Also set in England. The setting isn't the most important thing to me. I like strong, independent, intelligent characters with compassion and honor who will stand up and fight for their beliefs. Camelot is one of my favorite musicals. It had royalty, betrayal, murder, Knights of the Round Table, compassion, honor, integrity, magic and love! Unfortunately I have not had the pleasure of reading any of your books yet Rowan. Hi All! Thanks for stopping by. I'm flying today. Will respond to comments when I reach my destination. Have you ever visited Scotland. I am one of the children of Kintail near Skye Scotland seat is Eilean Donan Castle as I am American born but this is my ancestral heritage Clan Macrae. I love the Medieval era. I read Rowan's debut and really enjoyed it. I can't wait to read this book! Love the cover of this book and it sounds awesome! I would love to read it. It is my favorite type of read. I tend to go for the older the better time frames. I've been hearing about this book and she is a new author for me - sounds like something I would enjoy very much! I enjoy a good book, regardless of location, but I especially enjoy witty banter throughout. No, I have not read Rowan's books, but I'd sure like to change that now, LOL! Love historical romance and would love to win. I haven't read any new medieval romance in a loong time :) This definitely caught my eye. Thanks for sharing! I love medieval romances as long as it is a good book. No, I haven't had the pleasure of reading any of Rowan's books yet. Thanks for the giveaway! I would have been drawn to this cover, even if I hadn't read the review! Medieval romance is very different than Victorian or Regency, since there aren't as strict rules, politically, legally or socially. The men would be bigger & hunkier! Have always loved medievals and glad to find another author to read, not so many to find now. I like the especially alpha protective knights and warriors, but also the intelligent and independent heroines as they often tend to be,along with the politics of the era. I also love when they involve the druids and mystical. I haven't read a medieval romance in awhile, but from what I remember there is always straw on the floors. It's a much rougher era then the Regency & Victorian periods. I haven't read a medieval book in a while, but love them. WHEN A LAIRD TAKES A LADY sounds very good. Rowan is a new author for me. Julie Garwood's Medieval Highland stories were the first romances I read and the category has been a favorite ever since. I wasn't aware of these two books, but this sounds like a series I will have to read. I hope Rowan Keats Is around writing her Highland stories for a long time.